If you are looking for a new, powerful notebook and happen to live in Japan, you might want to check out the new Nextgear-Note i400PA1 manufactured by Mouse Computer. This model is apparently the latest addition to the company’s G-Tune Series of high-performance portable PCs and is aimed at gamers and multimedia aficionados. The i400PA1 comes equipped with a third generation (Ivy Bridge) Intel Core i7-3820QM central processing unit. This chip is ranked 9 in our CPU Benchmark List and offers four cores clocked at 2.7GHz (up to 3.7GHz via Turbo Boost 2.0 Technology), 8MB of Level 3 cache and the integrated Intel HD 4000 video card. In addition, the laptop sports a 15.6-inch anti-glare LED-backlit display of Full HD native resolution (1920-by-1080 pixels) accompanied by the discrete NVIDIA GeForce GT 650M GPU (based on the 28nm Kepler Architecture) with 2GB of dedicated DDR3 VRAM. According to the maker, the notebook houses 16GB of internal DDR3 memory, a 1TB mechanical hard drive and a 128GB SSD for fast boot and resume times. Built around an Intel HM76 Express Chipset, the i400PA1 packs two USB 3.0 ports and two USB 2.0 ports, a Blu-ray optical drive, Wireless LAN 802.11 b/g/n and Bluetooth 4.0+HS radios, multimedia card reader slot and an integrated 1.3MP web camera for video conferencing. The portable gaming PC runs on a 64-bit Windows 7 Home Premium operating system and weighs 2.58kg with the built-in battery that has an autonomy period of up to 4.75 hours. 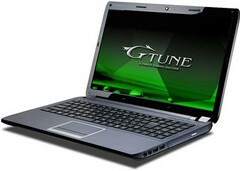 Reportedly, the new Nextgear-Note laptop is now commercially available, priced at 139,860 JPY (about $1,750). There is still no word on a North American/European release just yet.